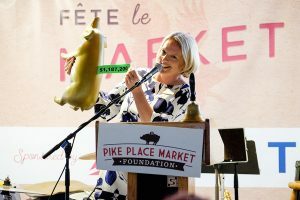 Thanks to YOU, the Pike Place Market Foundation is in the midst of wonderful growth and transformation – we call it our “new day”! Last year, we completed the Pike Up! capital campaign to help build the MarketFront, opened a new hub for the community with The Market Commons and expanded our grant making to address emerging needs. Your commitment, support and investment in the Pike Place Market community is why we are here today. I continue to be amazed by the unprecedented economic and population growth in our city and the wide gap in affordable housing and services for our most vulnerable neighbors, despite much analysis and conversation. We know that strong communities are lifted up as a whole and not in fragmented parts. 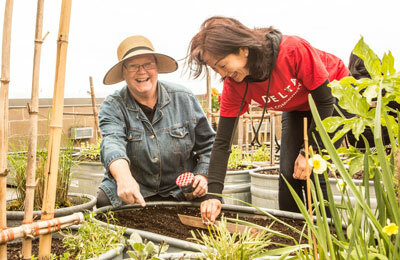 When the health of the whole community is truly nurtured, everyone thrives. That’s why our vision is to nurture a thriving Market Community so that everyone within it has the opportunity to live the best life possible. 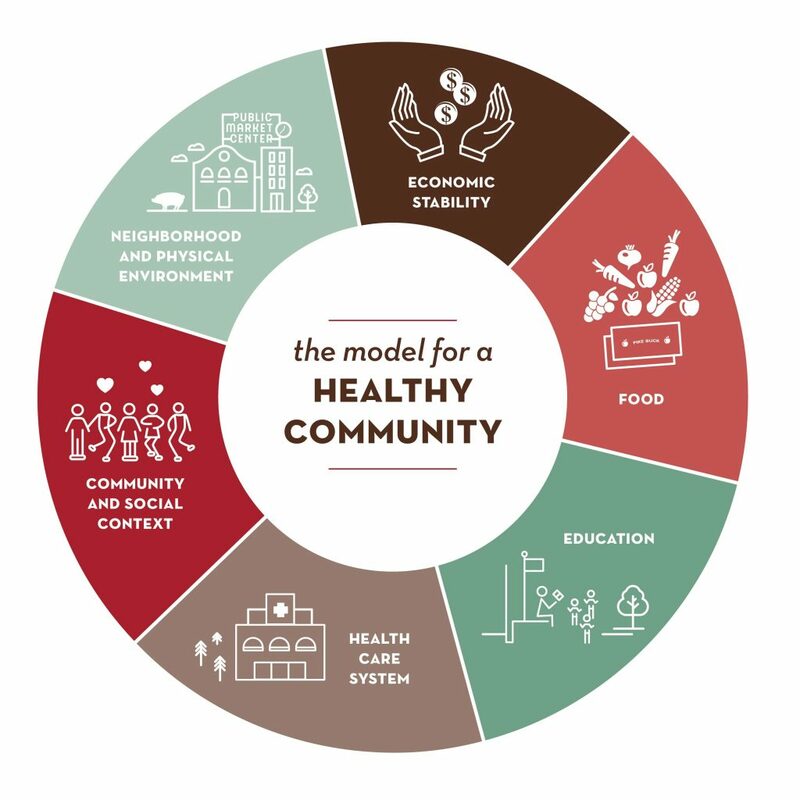 We’ve been living out community building practices in the Market for more than 100 years and we’re thrilled to now see evidence-based research from the Henry J. Kaiser Family Foundation and the Centers for Disease Control and Prevention that clearly demonstrates the link between strong communities and health equity. 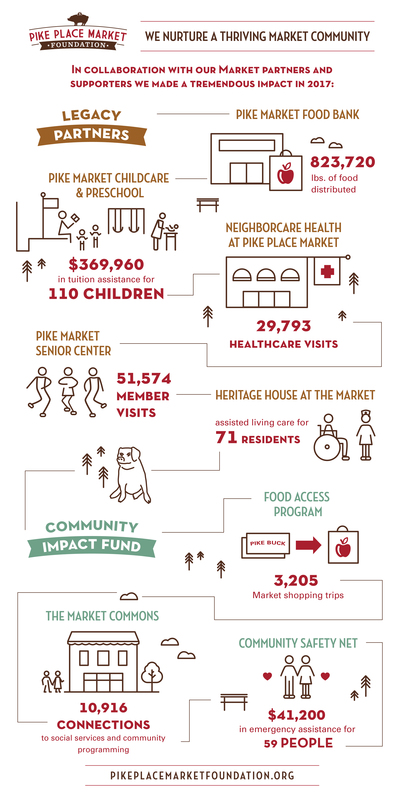 This research focuses on the Social Determinants of Health for a community and it also aligns with our mission and helps us measure our impact here in the Pike Place Market community. The Pike Place Market community already includes every element of this model for a healthy community, and this structure will guide us as we focus our attention and resources on the areas that need more support. Since 1982, The Market Foundation has granted more than $30 million to the Market community to ensure our most vulnerable neighbors find housing, healthcare, healthy food, child care and a community of support in the Market. Nurturing this community so that everyone has the best life possible continues to drive us to do more, find better solutions and be more responsive to the needs we see. Opening The Market Commons, a new community-driven resource center, was a vital first step in a more focused vision to not only support, but to actively nurture a thriving community. Market community members now have a place to come together to meet their neighbors and participate in a wide variety of social programs. The Commons staff are ready to help anyone who walks through the door navigate social services in the Market and throughout Seattle with a warm smile and a cup of coffee. It’s a welcome respite from our fast-paced, ever-changing city. Additionally, we expanded our grant making framework to include the addition of a new Community Impact Fund to address emergent needs. We look forward to sharing with you what’s on the horizon in the year ahead. Welcome to our “new day” and thank you for being our partner in bringing this community together to keep the soul of Seattle strong. See the lasting impact of your donations at the Pike Place Market. Heritage House at the Market supports downtown residents who require personal care and financial assistance. Housing options for low-income seniors with personal care needs are scarce, and Heritage House at the Market is the only assisted living facility in the downtown community that will care for residents who are on Medicaid. Last year, 75% of Heritage House residents became participants in the Providence ElderPlace program (PEPS). Through this enrollment, Heritage House was able to re-establish an onsite medical clinic that allows PEPS participants to see their primary physician at Heritage House. Next year, Heritage House hopes to receive the support required for residents with dementia and end-of-life care needs to remain at Heritage House. The Pike Market Food Bank serves anyone facing food insecurity who lives in downtown Seattle, housed or homeless. Last year, the demand for food bank services rose by more than 15%. On average 1,000 people visit the food bank every week and more programs were created to expand their reach into the community. Food bank staff and volunteers delivered groceries to 120 people a week who have difficulty leaving their home. This was an increase of more than 21% since last year. Also In 2017, a no-cook bag service was piloted and then made permanent based on hundreds of people a week requesting ready-to-eat and easy-to-carry foods. Hours were also expanded to include Wednesdays from 4 – 6pm to serve the Market community of vendors and others who work downtown. Next year, the biggest challenge the food bank will face is finding the resources required to serve a huge increase in anticipated food bank shoppers with the upcoming closure of the only other downtown food bank, the Cherry Street Food Bank. 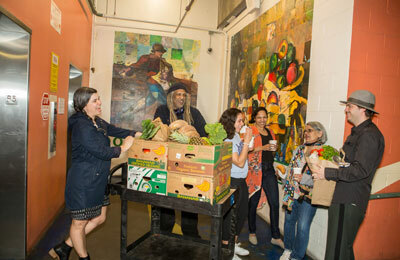 Learn more about Pike Market Food Bank. Patients served by Neighborcare Health at Pike Place Market are primarily older adults dealing with multiple barriers to accessing the health care they need. Many clinic patients are also struggling with housing stability, mental and behavioral health issues, substance abuse and have had a lifetime of trying to manage illnesses without regular access to medical care. 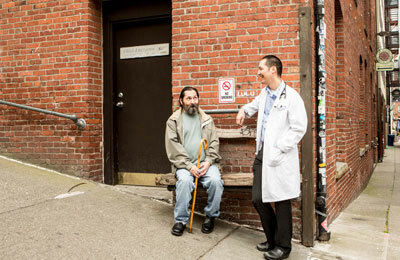 Last year, Neighborcare Health at Pike Place Market served 4,644 patients through 29,793 appointments. This includes both visits in the clinic, as well as through outreach visits from the Housing Health Outreach Team and Reach program – where medical staff visit and serve patients in low-income housing. 68% of clinic patients live below the Federal Poverty Level ($12,060/year for an individual) and more than 1,563 patients reported being homeless or recently homeless. More than 45% of patients are people of color. One of the biggest successes seen at the clinic last year was the growth in providers able to administer Medication-Assisted Treatment (MAT) for patients struggling with opioid use disorder. This is particularly important because downtown Seattle has a death rate from opioids that is three times the rate for King County as a whole. Neighborcare’s biggest challenge next year will be helping patients navigate the changing landscape of health care and services in Seattle as the cost of living continues to grow while their income levels are unable to keep pace. A priority for the coming year is to strengthen resources to overcome barriers in connecting with new patients and integrating them into regular schedules of care. Pike Market Child Care & Preschool serves 110 children each year in the Market community, prioritizing families who earn very low to moderate incomes. Last year, the preschool was able to provide $364,000 in tuition assistance to 65% of families in the program, putting high quality early education, great nutrition and family support within reach for those that otherwise couldn’t afford it. Long committed to social justice and equity, PMCCP implements anti-bias education and has an Equity Change Team exploring the intersection of race, gender, and income inequity to promote institutional change to better serve the school community. This nationally accredited program is leading the way with cutting edge practices that impact the quality of life for children, families and staff. PMCCP is always striving to improve their ability to cultivate a community in which everyone is seen, valued and has a sense of belonging in which children can develop their full potential to thrive and be caring members of a diverse society. 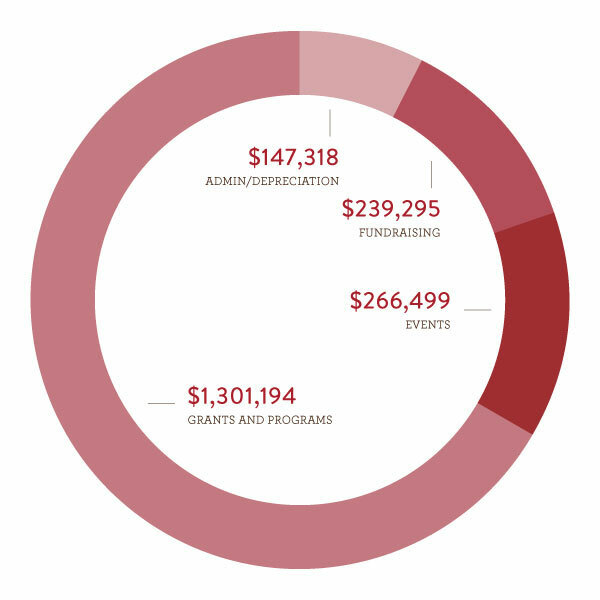 The preschool’s challenge for next year is to meet their $368,000 tuition assistance commitment, while providing excellent benefits and fair wages for teachers, and to deepen anti-bias programming by increasing opportunities for experienced teachers to take on leadership roles with newer teachers. Learn more about Pike Market Childcare and Preschool. The Pike Market Senior Center serves the most vulnerable population of any senior center in Seattle, reporting over 51,000 visits and over 49,000 meals served over the last year. The majority of senior center members live on little or no income, nearly half are homelessness, and most are at risk of social isolation. These resilient seniors look to the senior center not only to access basic needs like food, housing and shelter, but also where they see friends, play games, watch films, and other activities – all at no cost. Last year, Pike Market Senior Center created a project to share their expertise in assisting homeless elders with senior centers across King County. Through SHARE (the Senior Homelessness Action, Resources, and Education Project), PMSC staff made site visits and created a guide and resource book to help other senior centers become better resources to homeless clients. Next year, their goal is to increase their social work case management to seniors with severe needs. They also hope to improve access to information, assistance and referral services to help clients with less complicated concerns – relieving social workers from performing these duties. 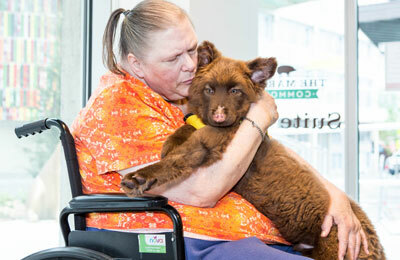 Read more about Pike Market Senior Center. The Food Access Program at The Market Commons strives to create an equitable path for all people at Pike Place Market to establish and maintain food security. Programming is broken down into four components: shopping programs, pilot programs, education and management of the Secret Garden. All our shopping programs match food stamp dollars at the Market and double dollars for low-income shoppers when they purchase fresh fruits and vegetables. In 2017 we subsidized 3,205 shopping trips from participating produce vendors and farm stands within the Market. In 2017 we also piloted a program with the Food Bank and the Child Care to provide bags of food for low-income families outside of food bank hours. Through another partnership, the Secret Garden produced over 500 pounds of culturally relevant food for the Food Bank. In 2018 we are working to evolve our educational programming to better provide a balance of experts and topics. In our first year, we are proud to report that our neighbors, community members and Market vendors walked through our doors 10,916 times. We made 6,155 connections to housing, healthcare, groceries, and other needed social services and welcomed our neighbors 4,761 times for our community programming, including 903 hours of cooking classes, drawing courses, meditation seminars, community potlucks and much more! We’re just getting started and we wouldn’t be here without the support and participation of the entire Market. Next year, we’re planning on expanding our programming and our outreach efforts, so that we can continue to meet more of the community’s needs. The Community Safety Net provides one-time financial assistance to Market community members who are experiencing crisis and need funds to prevent unnecessary loss of well-being, livelihood, or housing. In 2017 we were able to give $41,200 to 59 people in the Market in need. The Community Safety Net is the evolution of the previously established Emergency Rent Fund and Farmer Relief Fund; by combining these funds, we can widen the eligibility to the merchant, daystall, and busker communities, as well as to include requests made by the social workers of Market agencies. In 2018, our goal for The Community Safety Net is to receive referrals of at-risk clients that we can offer more preventive measures through the resource desk at the Market Commons. We also aim to provide better background support and communication for Market community members applying for the Safety Net. Meet The Market Commons Team! Welcome to The Market Commons – our resource center where the Market community can come together and meet smiling faces ready to help access social services in and around Pike Place Market. 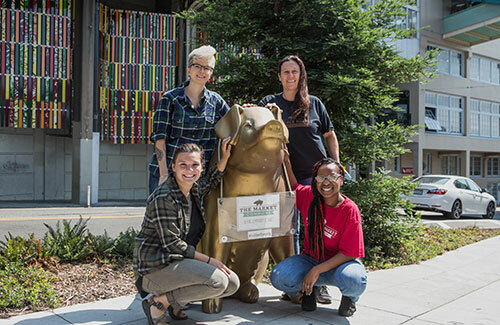 We’ve had an incredibly successful first year at The Market Commons, and tt’s all thanks to The Market Commons staff – Crystal Dixon, Velma Chaney, Allie Wass and Kathryn Hortner. Combining their diverse backgrounds with their love for the Market, these women work in tandem to ensure every client who walks through their doors receives the proper help and connections to not only survive, but thrive. Velma Chaney, (pictured lower, right), is typically the first face you see when you enter The Market Commons. She’s ready to answer your questions and make you feel at home! Hailing from Jackson, Mississippi, The Market Commons is Velma’s first full-time role after interning and volunteering for social service agencies throughout Seattle. She is passionate about giving back and supporting the seniors that make up our happy community, and is guaranteed to put a smile on your face. Americorp Vistas have also played a vital part in The Market Common’s success. Our Outreach Vista, Allie Wass (picture top, left), helps with reaching out to the community and uses her artistic skills to teach free arts programming for our seniors. Our Food Access Vista, Kathryn Horner (not pictured), is working on restructuring and re-invigorating the Food Access program. She also worked closely over the 2018 summer with fellow Vista Alex Taylor (pictured lower, left), reviving the Pike Market Secret Garden and introducing gardening programs for our preschool students and seniors. With a team this strong, it’s no wonder that The Market Commons will continue to grow! Stop by and say hi next time you are on Western Avenue! Learn more about The Commons at TheMarketCommons.org, and follow @TheMarketCommons on Facebook and Instagram to see how we’re building a stronger community! 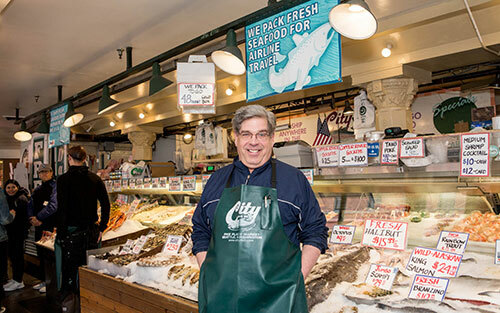 Jerry Antush, host of Pike Place Podcast and Market fishmonger, is more than anther friendly face at Pike Place Market. 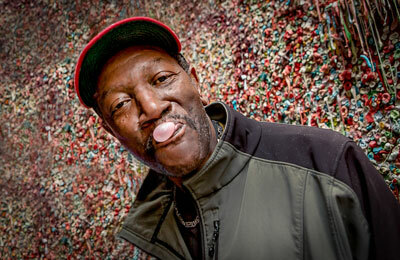 A lifelong Seattleite, his Market career began in the 1980s as “The Juice Man” at Scotty’s Juice Bar. It was decades ago that he first realized it was more than a Market: “It’s always been the people – that’s what’s fun about the Market, you never quite know what to expect,” said Jerry. Jerry has been an active member of the Market community and always gives back when he can. So when he became sick a couple of years ago and had trouble with his rising housing and healthcare costs, the Market was there to give back to him. 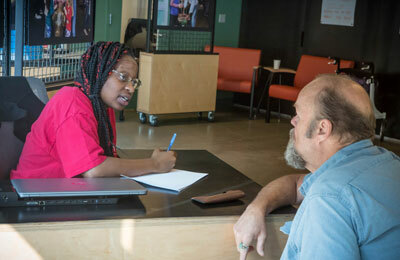 Through the support of the Pike Place Market PDA and the connections he made at The Market Commons, Jerry was able to communicate his need for help. He applied and was accepted into the low-income senior housing on the new MarketFront, joining a close-knit community of seniors with a long history at Pike Place Market. Now a much closer commute to both his workplace at the Market and his health care treatments, Jerry was able to make a full recovery within the year! 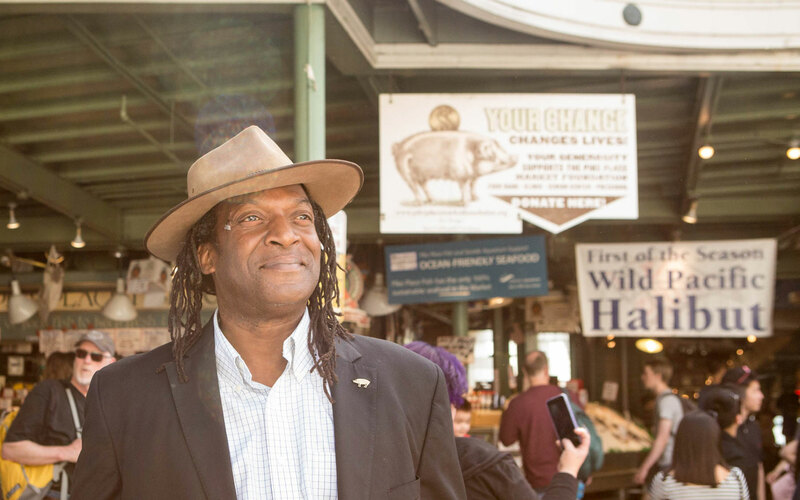 He’s using his newfound health, home and energy to continue his community involvement – this time, he’s set on telling the story behind the kooky and caring characters that make up Pike Place Market. In addition, he’s developed a new title for himself: Marketologist – and together with his producer Bob Trombley – they’re hosting the Pike Place Podcast: a weekly show to tell the stories of the icons, innovators, characters and kooks who are the Pike Place Market community – characters just like Jerry “The Juice Man” himself. This exciting new project is the first grant from Billie’s Bank – the new community grant-making fund recently made available through The Market Commons. It was a typical weekday in July for almost all of the Edelman Seattle office, but for board member Chris Volk and his team of communications marketing specialists, this day would have much more meaning. Meeting up at the Pike Market Food Bank, the team looked excited and ready to learn what it meant to be a food bank volunteer. Volunteer Coordinator, Jill Weidman, enthusiastically greeted the team, leading them on a tour of the space and quickly assigning the day’s duties. Over the course of four hours, they picked up donated food from businesses all around Pike Place Market, helped organize dry goods, and helped some food bank shoppers fill their weekly grocery bags. There was much to be done, and yet the Edelman team couldn’t contain their big smiles throughout the day’s work! Chris wasn’t surprised – this was just one of his many visits bringing an Edelman team to volunteer at the food bank and showing them behind the scenes of Pike Place Market. He believes it’s vital that his team is exposed to the Market’s social services, especially if they’re going to work as pro bono consultants for the Market Foundation! That’s what makes Edelman such a generous partner. Not only are they committed to giving back to the greater Seattle community by being annual volunteers, but they’re also lead sponsors for the Market Foundation as they work year-round to raise awareness about our mission and events. With Edelman’s support during this year’s Sunset Supper, we were able to break our record for both number of guests and total funds raised! 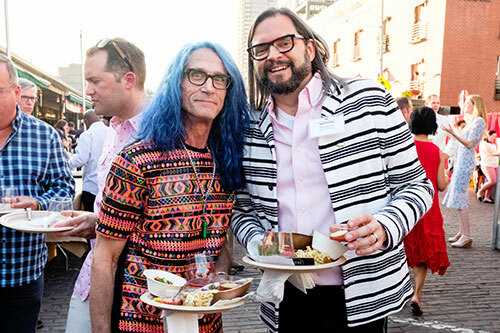 2018’s Sunset Supper was prominently featured on KING5, KOMO4, and Q13 garnered mentions in local entertainment publications such as Seattle Magazine, The Stranger, and more. 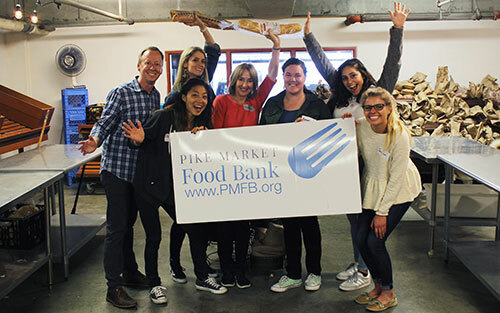 Edelman Seattle provides generous donations, volunteer time and impactful PR work to Pike Place Market Foundation, helping promote our mission to more people than ever. Thanks, Edelman Seattle! In late June of this year, regulars and newcomers to the legendary Le Panier received a special surprise at the register – their croissant was only 60 cents! In fact, all of the award-winning French pastries, – from the flaky chocolate croissants to the fluffy French baguettes – were the same price they had once been in 1983. The community was treated to a celebration of the 35-year-legacy of Le Panier, the French bakery that has become one of the most generous (and tastiest!) staples in Pike Place Market history. It was around this same time, 35 years ago, that a young Kristi Drake and Thierry Mougin were part of the first staff at the brand new Le Panier. The bakery was committed from the start to bake all its goods from scratch every day, just like the ‘boulangeries’ in France. Kristi and Thierry were kindly welcomed into the Pike Place Market community, establishing lifelong relationships with many of the Market vendors and artists. “I like to go shopping at the Market, but it can take over an hour and half with all of the people I’ll run into!” says Kristi with a big smile. Le Panier has donated countless baked goods to all corners of the Market community. Every week, the staff prepares a generous helping of freshly baked bread, pastries, and savory treats for the Pike Market Senior Center & Food Bank – allowing our hungry neighbors to enjoy high-quality and locally sourced cuisine at no cost to them. These gifts are only bolstered by the bakery’s financial support of the Market Foundation, donating thousands to our mission to nurture a thriving Market community. Thanks Kristi, Thierry, and the entire team at Le Panier for everything you do! Ten years ago, Dan was hard at work finalizing the Pike Place trademark licensing agreement in his position as Marketing Director at Starbucks, for Starbucks Pike Place® Roast coffee. While visiting the Market, he was given a behind the scenes tour of the social services partners — and was surprised to see that the Market offered so much more than fresh fish and flowers. Immediately, Dan spearheaded donations of Starbucks coffee and pastries to the Pike Market Food Bank, but this was only the beginning of their generosity to the Market Foundation. Dan then joined the Market Foundation’s Board of Directors in 2010, and he ramped up his support for the Market community. Through his efforts, Starbucks has become a generous sponsor, donating coffee, products and other goods to our events and Market service partners. Starbucks was also the first company to donate $500,000 for the Pike Up! campaign to build the new MarketFront, and Dan jump-started the wave of investments that led us to achieving our $9 million fundraising goal! Together Dan and Carter have encouraged other companies to sponsor, colleagues to volunteer, and their downtown neighbors at Escala to give generously. 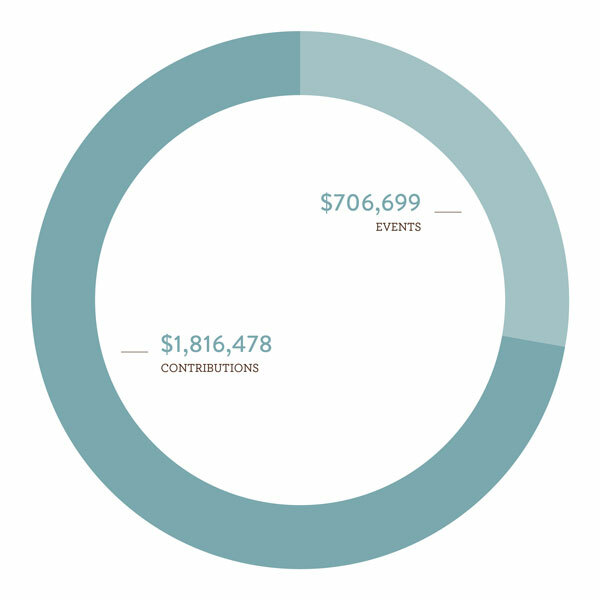 Through the years, Dan and Carter have influenced more than $1.5 million in donations to the Market Foundation. But, that’s not the only reason we appreciate them so much. When you talk to them you can see on their faces just how much admiration and love they have for Pike Place Market. 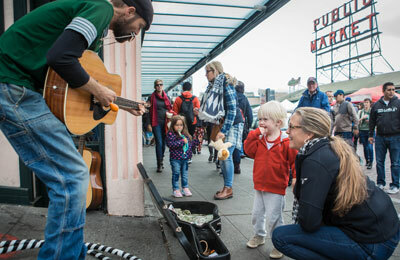 Thanks, Dan and Carter for sharing your love with Pike Place Market! We want to thank all of you who donated for a Market Charm and/or a Hoofprint! With your contribution, you become not only a part of Pike Place Market history, but also part of our mission to nurture our thriving Market community! To see your name on our PiggyBackers list, please click here. Thank you to the following individuals and organizations for supporting the Pike Place Market community through an annual gift to The Market Foundation last year! We apologize for any missing, incorrect, or misspelled names throughout this report. We would greatly appreciate assistance in helping us correct our records. Please call (206) 774-5255 or email mktfoundation@pikeplacemarket.org with changes. Your support connects the Market community to housing, healthcare, nutritious food, childcare, and life-changing resources in and around the Market. Help us continue to nurture our thriving Market community! 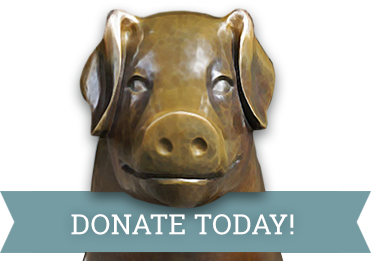 85 Pike Street #500, Seattle, WA 98101 | 206-682-7453 | mktfoundation@pikeplacemarket.org Pike Place Market Foundation is a 501c (3) organization. Our tax ID is 91-1197625 | © 2019 Pike Place Market Foundation. Website by DEI.